We all had that one friend in high school, the one who couldn’t drive to save their lives. They had a way of hitting every curb when taking U-turns tighter than normal people would attempt, and whether it was a near miss every time they texted behind the wheel or a prolonged honk when they merged lanes without really looking, riding shotgun always felt like an exercise in faith. Somehow you just knew their families never asked them to drive Grandma to church, and I may not be around to tell this tale if my version of that friend didn’t drive a GMC Canyon. It’s an excellent car for horrible drivers to cut their teeth with, because baked into its chassis is an ability to take abuse and then, without flinching or skipping a beat, ask for more. So when GMC offered to leave a 2019 Canyon in airport parking for me to drive home with after landing in San Francisco, there was no way to say no. Why deny a chance to drive the truck that allowed you to live past adolescence? There was of course, another factor motivating the decision: the fact pickup buyers are revitalizing the midsize truck segment at the same time as they dump increasingly large piles of cash into "luxury” pickups. Since those are two demands the Canyon tries to cater to, I had to see if it did so effectively without losing the rugged personality I had survived alongside in high school. My previous adventure with the Canyon took place over a decade ago, but the 2019 model I collected from long-term parking didn’t look as cheap or expendable as the first generation did. It had a lot more chrome and a low-hanging lip under the front bumper now, making it look upscale but also fragile. Trading sturdiness for bling was necessary for GM because after it debuted the second generation Canyon in 2012, it realized it needed to further differentiate the GMC it from its Chevrolet cousin, the Colorado. 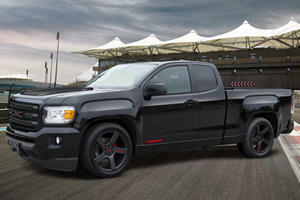 GM made additional revisions to the truck in 2014, giving the Canyon a more mature front end complete with large boxy headlights and a rectangular grille sitting between them. Just about everything else on the Canyon looks the same as it does on the Colorado. Being a Denali, however, means the Canyon still stands out in San Francisco where the looks you get stem from eyes at the end of long noses. For that you can thank GMC’s penchant for throwing large helpings of chrome onto everything with a Denali badge. In this case the shiny stuff is added to the Canyon’s door handles, side mirrors, foglight and taillight housings, side steps, and side window borders. Filling out the price tag are a few dealer-installed options including black 20-inch wheels and chrome recovery hooks. Combined, these options give the Canyon Denali a presence that’s conducive to contradicting lifestyles, like the construction site manager who likes to dress up and hit the town at night or the white-collar ladder-climber who wants a head-turning commuter but spends each weekend kayaking or mountain climbing. The theme inside allows these fantasies to play out thanks to more dealer-installed options, like all-weather floor liners and an attractive "Techno Steel” trim that preserves the dirt-loving work truck environment while adding hints of flair. Among the Denali’s interior amenities are an 8-inch touchscreen infotainment system with Apple CarPlay and Android Auto, a seven-speaker Bose audio system, a heated leather steering wheel, and heated and ventilated leather-appointed front seats. The infotainment system works well and ranks slightly above average in terms of intuitiveness-much better than Toyota or Nissan but not quite as fluid as a Ford’s. While the screen looks small placed between large air vents, what’s not lacking in size is the Canyon’s cabin. It has plenty of open space to keep the interior looking bright despite the Onyx Black paint job my tester had. Modern touches like a wireless phone charger and onboard WiFi help the Canyon stay fresh enough to see it out of the 2010s, but the interior leaves something to be desired. Like the Sierra we recently drove, a dated cabin and lack of eye candy inside makes the Canyon feel undeserving of its Denali badges. 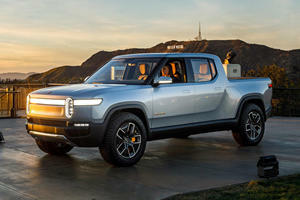 That might discourage buyers from ticking off that box when optioning their Canyons, especially since the simple and rugged personality of the truck’s insides can be felt at all trim levels. Similar to the interior in the sense that it’ll soon be a relic is the Canyon’s powertrain. Though this GMC is available with a 2.5-liter inline-four and a 2.8-liter four-cylinder Duramax turbo diesel, my Canyon Denali was given the range-topping 3.6-liter V6 that makes 308 horsepower and 275 lb-ft of torque. It’s not as fancy or efficient as the 2.3-liter EcoBoost in the Ford Ranger, but it does produce fuel economy numbers in line with competitors like the comically old Nissan Frontier and strong-selling Toyota Tacoma thanks to a cylinder deactivation feature that allows the 4WD V6 Canyon to achieve 19 mpg combined, 17 mpg in the city, and 24 mpg on the highway. Given that the six-speed manual is being phased out of the Canyon and Colorado, the only transmissions available are an eight-speed auto for the V6 model and a six-speed auto for the two four-cylinder engines. The engine’s old-school nature might make it a standout pick for EcoBoost haters because it delivers horsepower quickly and linearly. 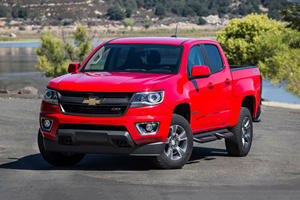 It sends the Canyon from 0-60 mph in 6.3 seconds before the truck tops out at 99 mph. Along the way, the transmission changes gears adequately, not too softly or violently, just harshly enough to let you know this gearbox is designed to put up with a little bit of hell. Like all trucks should, the Canyon can tow-up to 7,000 pounds with the V6 and 7,700 pounds when equipped with the Duramax diesel. That comes in handy if you opt for a smaller bed and find yourself with more to haul than will fit behind the rear seats. Speaking of the bed, the Canyon is available with two versions of it. One is 5’2” long and another comes with 6’2” of length. The size of the interior can also be varied as well, with the smaller Extended Cab being packaged with the longer bed by default and the larger Crew Cab being available with either of the two beds. Opt for the Extended Cab or the Crew Cab with the shorter bed and length stays at 212.4 inches with a 128.3-inch wheelbase. Our Canyon was the largest of the bunch, a Crew Cab with the longer bed sitting 224.6 inches long, with 140.5 inches of that going to the wheelbase. Width stays at an easily manageable 74.3 inches no matter the cab and box combination while height ranges from a low of 70.3 inches for the 4WD Extended Cab to a high of 70.7 inches for the 2WD Crew Cab. The cabin itself feels open and roomy, even more so than the last-generation Silverado. In Crew Cab spec, it comfortably seats five thanks to 41.4 inches and 38.3 inches of headroom in the front and rear, respectively. The Extended Cab loses 1.6 inches of headroom at the rear, but the 28.6 inches of rear seat legroom best exemplifies how much smaller the cab is when comparing it to the Crew Cab’s 35.8 inches. All models hold onto 45 inches of front seat legroom, enabling easy ingress and egress even for the taller among us. Driving Impressions: Why Can't SUVs Still Be Like This? Even if I can’t be bunched together with the taller people of this world, sitting in the captain’s chair gave me a good view of the surrounding area and insight into a major advance the Canyon has made since I last rode in one. It’s the way the truck pulls off jobs that previous versions of larger pickups were needed for but still feels nimble and most importantly, ready to take abuse. It’s easy to see out of, and without the wide body of a full-size truck, it’s easy to drive the Canyon through narrow city streets without fearing for the paint job. Even on the winding high-speed highways just North of the Golden Gate Bridge, keeping the Canyon within its lane wasn’t too much of a chore despite softish steering. A quick rack saves the wheel from being too much of a handful at speed, but as you’d expect the Canyon feels much more comfortable gorging on dirt roads or being driven playfully in the city. You wouldn’t think a cushy suspension that munches up bumps and sways hard in the corners would be fun to drive in the Bay Area, but it is. San Francisco, as littered with hills, potholes, and steel plates as it is, proves to be a stressful place to drive high dollar luxury cars. The Canyon, on the other hand, feels right at home. The engine sounds rough when pulling hard, but I still couldn’t stop myself from gathering speed up hills and then descending hard on a collection of knurled pavement and steel plates at the bottom of each crest. It was fun. The suspension would go to work tackling the bumps without making the chassis flinch, and after passing through the Canyon kept straight as if nothing had happened. It’s addicting, that feeling of invincibility. Behind the wheel of the Canyon, the world turns into a playground. With more room for cargo than just about every crossover and a cabin just as large (provided you opt for the Crew Cab), the GMC Canyon’s utility and handle-anything attitude left me with the feeling that it’s a viable alternative for those who need capability, don’t want a full-size truck, and like to drive in ways that’ll tear a modern crossover apart. That’s not to say the Canyon is perfect. During my week driving it around San Francisco and taking it to slippery Marin County hills to test its 4WD system, the brakes consistently felt like they could use more oomph. It took digging deep into the pedal’s travel to get meaningful stopping power out of the Canyon, which I needed plenty of considering the speeds you can reach when not having to brake for road imperfections. And then there’s the low front end, the only piece of the Canyon that’s not conducive to attacking terrain with prominent features (that includes tall curbs). 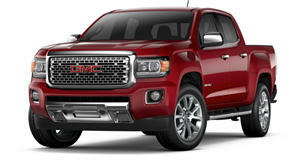 One good reason for babying the Canyon Denali is its price tag. The test truck GMC lent me for the week stickers at $48,025 including destination. Yikes, yes, but that can be knocked down to $44,795 without the dealer-installed options or $37,890 including destination if you just want the 4WD Crew Cab V6 with an extended bed and no Denali badging. The cheapest way to get the Canyon is to go for the 2WD Extended Cab with the 2.5-liter four-cylinder, putting the truck at $30,590 including destination. At the other end of the spectrum is the most expensive way to outfit the Canyon, by opting for the 4WD Crew Cab Denali with a long bed and the 2.8-liter Duramax turbo diesel for $49,025. If the sensible middle ground is more your thing, rest assured that GMC gave the Canyon a variety of trims to suit all needs. They include the base Canyon SL, Canyon, SLE, SLT, All-Terrain, All-Terrain Leather, and Denali. As you'd expect, lower trims swap those 20 inch wheels for less visually impressive sets and lose the ample amounts of chrome trim. The All-Terrain variants have their trim pieces blacked out for a more rugged look, but our biggest complaint with the Denali package's technology suite is that it doesn't include many driver aids. Despite its price, my Denali only had forward collision alert and lane departure warning. Verdict: An Alternative To 'Soft' Crossovers? No matter the trim you choose, at its core the Canyon is still the same truck that it was before, the one that took abuse from my horrible driver of a friend back in high school. It just happens to be larger and more capable now. It rides similarly, keeping its soft suspension and using the padded ride and quick steering to encourage rough treatment, but the prettier exterior begs for a little prudence when driving it over harsh roads. Still, it’s nowhere near as fragile as the seemingly endless array of crossovers currently on the market. Behind the wheel it feels even tougher and more capable than a full-size truck, but that has more to do with how easy it is to drive. Yes, you sacrifice the comfort that a crossover could offer and no, the Denali package does little to make the Canyon feel luxurious. But it’s hard to beat the feeling of supreme confidence over any roads that the Canyon delivers. When it came time to give it back, I couldn’t help but want to go back to the days when body-on-frame chassis were under all SUVs.